WASHINGTON (Reuters) - When a political impasse last month pushed America to the brink of default, the Obama administration noted with apprehension that it had to borrow vast sums every Thursday. This debt strategy has kept financing costs low but left Washington vulnerable to a sudden loss of lenders' trust as lawmakers debate whether to raise a cap on public borrowing. Next week, the U.S. Treasury will unveil plans for a new borrowing tool that could eventually take some of the edge off future fiscal debates. Most U.S. politicians understand that not raising the debt ceiling can trigger default within days or weeks. What is less appreciated is that if creditors balked at any of the weekly auctions where the Treasury must raise $100 billion to repay short-term debts, the federal government could go broke immediately. 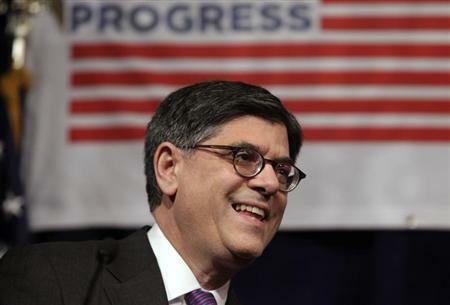 "We could unexpectedly dissipate our entire cash balance," Treasury Secretary Jack Lew told lawmakers on October 10. The new borrowing tool is part of an effort to reduce the U.S. government's reliance on short term debt, which increased dramatically over most of the last decade to cover ballooning budget deficits. Under the new program, the Treasury plans to start selling 2-year floating-rate notes at regular auctions beginning in January. The yield on the new notes will move up or down depending on rates for 3-month Treasury bills, and officials have said initial sales will supplant issuance of debt maturing in under a year, rather than longer-term fixed-rate debt. That means the new notes, known as FRNs, will probably not increase the exposure U.S. taxpayers have to future increases in interest rates. And eventually, the FRNs could make debates over the debt ceiling a little less harrowing, said Lou Crandall, an economist at Wrightson ICAP in New York. "Over time, an FRN program can materially reduce the amount of bills you need to refinance every single Thursday," Crandall said. Still, it will probably take a long time to do that considering the degree to which Treasury depends on short term borrowing. While the Treasury has extended the average maturity of its debt since 2009, about a quarter of federal debt still comes due in less than a year, twice as much as was the case two decades ago. The Treasury will say on Wednesday how many FRNs it will sell in the first quarter of 2014. Officials told bankers and investors in April that the government was tentatively considering selling just $10 billion to $15 billion in FRNs per month, a small fraction of total issuance. That means the next debt ceiling debate, expected between February and March, will continue to feature giant weekly sales of short-term debt. The new debt program will straddle a tension between the government's desire to take out longer-term loans and a surge in investor appetite for short-term debt. Global regulators are making banks around the world hold more low-risk assets that can easily be sold for cash or used as collateral in other financial transactions. The regulations, many of which have not been fully implemented, aim to make the banking system more stable, and have helped keep yields on short-term Treasuries extraordinarily low this year. A 2-year floating-rate note is likely to count toward meeting firms' new liquidity and collateral requirements, which could make the note appealing to investors, said Mayra Rodriguez Valladares, managing principal of MRV Associates. The FRNs, which will be the first new type of Treasury since inflation-indexed securities were launched in 1997, would mean investors holding them won't have to restock their portfolios as often. Foreign central banks, corporations and money market managers are expected to buy the new security. "There will be appetite for it globally," said Rodriguez Valladares, whose firm advises banks and regulators on implementing the new regulations. Some potential buyers are skeptical, however. Gregory Whiteley, who manages a $53 billion government bond portfolio at DoubleLine Capital in Los Angeles, doesn't think he would get much out of a 2-year FRN that he wouldn't get from a three-month Treasury bill. If an investor wants to bet interest rates will rise over the next two years, as many economists currently expect, buying three-month bills will provide roughly the same gain in yield. And in terms of administrative effort, computerized debt management means it doesn't really cost investors or the Treasury much to roll over T-bills every few months, he said. Whiteley also doesn't see the Treasury gaining much by reducing short-term debt issuance because he said there wasn't a real risk of a failed debt auction even at the depths of the fiscal debate in Congress last month. U.S. Treasury debt is still one of the most trusted in the world and provides the foundation for the global financial system. The potential of a failed auction is more of a concern for poor countries with sketchy credit records, skeptics say. "It all seems pretty thin for generating a whole new security," Whiteley said. Nonetheless, the program fits into the Treasury's plans to borrow over ever-longer horizons, which gives it's debt managers more flexibility in scheduling Treasury auctions. The notes "give Treasury a new tool to support our ongoing goals of lengthening the average maturity of the nation's debt," Treasury Assistant Secretary Matt Rutherford told Reuters. They could also reduce the risk of a white-knuckle Thursday down the road.